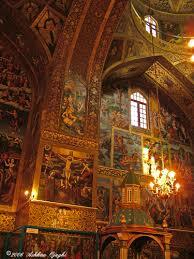 Built in mid 17th century, Vank Cathedral is the most important cathedral in Isfahan. The exterior dome is a simple Iranian dome made of bricks but the interior walls, arches and dome are richly decorated by oil paintings and gold inlay illustrating Jesus as well as Bible stories such as Adam and Eve. During time, new buildings have been added to the cathedral:  Clock Tower: This clock tower and its 300kg clock were installed in 1931.  Printery: The first printery in Iran and Mideas. 1-Library: Built in 1884 in the western part of the yard to preserve the Armanians‘ manuscripts. 2- Museum: Built in 1871. Most of the objects have been donated to the museum by people. Many of them are too valuable and unique. 3- Administrative buildings: To organize Armenians‘ affairs mostly in past, but it is still active.